Asteroid 1937 UB (Hermes) is a large (~1 km) object of considerable historical and dynamical interest. It eluded astronomers for 66 years between its 1937 apparition and 2003 rediscovery. As of Oct 2003, it was the largest asteroid ever observed to make a close approach to Earth within less than twice the distance to the Moon. Hermes is a potentially hazardous asteroid. Hermes was rediscovered on 2003 Oct 15 by Brian Skiff of Lowell Observatory. The rediscovery announcements appeared in MPEC 2003-T74 and IAUC circular 8223. A link with the 1937 observations was rapidly obtained by Steven Chesley and Paul Chodas (JPL); their work is summarized on MPEC 2003-U04. Shortly after the recovery, Andy Rivkin and Rick Binzel (MIT) reported an S-type classification in IAUC circular 8225. Our initial radar results are reported in IAUC circular 8227. The text of our IAU circular is also available here. An urgent proposal was submitted to Arecibo Observatory on Oct 15 (project R1898), and Hermes was imaged on Oct 18, 20, and 26. Hermes was also observed at Goldstone on Nov 4, 8, 9, 11. 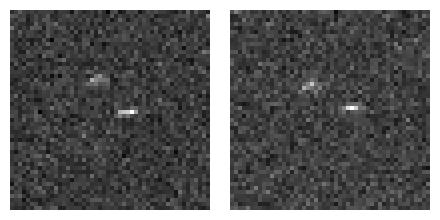 Hermes never came closer than 0.1 AU while in Arecibo's declination window, and never closer than 0.05 AU during the Goldstone observations, so this is a relatively faint target by radar standards. A Doppler spectrum of the radar echo obtained on Oct 18 shows two clearly separated components. The set of radar images below show the relative motion of the components over the course of about one hour on Oct 20. Motion is counter-clockwise. In each panel, the component at positive Doppler frequencies (right), moves toward the observer, while the component at negative Doppler frequencies (left), moves away from the observer. Radar illumination is from the top. The range resolution is 75 m.
Measurements of the range and Doppler positions of the primary and secondary allowed us to solve for the orbit of the binary system. The semi-major axis is about 1.2 km, or about 4 times the radius of the primary and secondary components. The orbital period is 13.9 hours, which corresponds exactly to the spin period of both components, i.e. the system is fully tidally despun to a so-called doubly synchronous state (like the trans-Neptunian object Pluto-Charon). Doppler broadening of the Hermes primary and secondary based on CW data obtained 2003 Oct 18, Nov 04, Nov 08, and Nov 11. 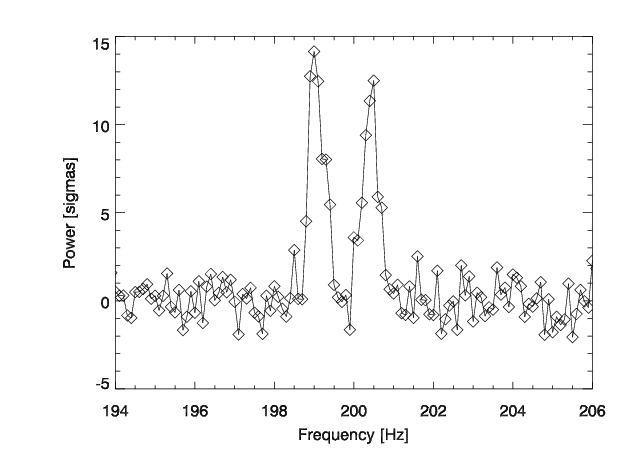 Echo widths were measured at a power level equivalent to three standard deviations of the noise, were assigned error bars corresponding to the frequency resolution, and were converted to a common 12.6-cm wavelength. The solid lines represent the expected Doppler broadening of bodies with 315-m and 280-m radii if their spin axes are perpendicular to our orbital plane solution. The orbit determination process does not incorporate any constraints related to the Doppler broadening of the individual bodies. 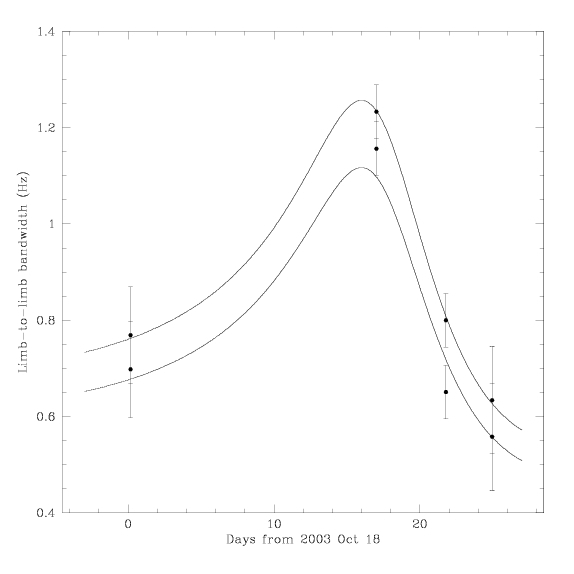 The good agreement suggests that the orbital solution is accurate, that the primary and secondary are not appreciably elongated, and that their obliquities have been driven to zero by tides. Although the signal-to-noise was relatively low and the number of images obtained was modest, it is possible to obtain a shape model that satisfies the data constraints. "Using radar, the position and velocity of Hermes has been measured to within 300 meters and 50 mm/s; much more accurately than with optical telescopes. Including those measurements in a new orbit solution suddenly allowed us to accurately predict Hermes motion over many centuries, from 1561 to 2103. During those 542 years, it makes 23 close approaches to the Earth, 29 to Venus, 7 to Mars, and 7 to a large asteroid called Vesta. Hermes closest approach was in the skies over the Earth in 1942, as World War II was fought underneath, when it passed about 1.8 times further away than the Moon. However, no one noticed it at the time. Eventually, the gravitational forces from all these encounters with the planets blurs out our knowledge of where Hermes will be, requiring more measurements in the future to make specific longer predictions. Although technically classified as a "Potentially Hazardous Asteroid", this only means it has an orbit such that, over hundreds of thousands or millions of years, Hermes could potentially come very near the Earth. However, there is no risk now." Jon Giorgini also provided a close approach table.